The services view is where you manage labor and transport on your opportunity. To access the opportunity services view, click the green Services view button at the top of the items list of an opportunity. It’s available when your opportunity is a provisional quotation, reserved quotation, or an order. Allocation is where you tell Current RMS which bookable resource is performing the service. For example, you might allocate contact for a Technician service, or a vehicle for a Transport service. Book out a service when the service is in progress. For example, when you know a contact has made it to site or a vehicle has left your store. Complete a service to mark it as done. Each of the steps in the process are quite general and can be tailored to suit your business. 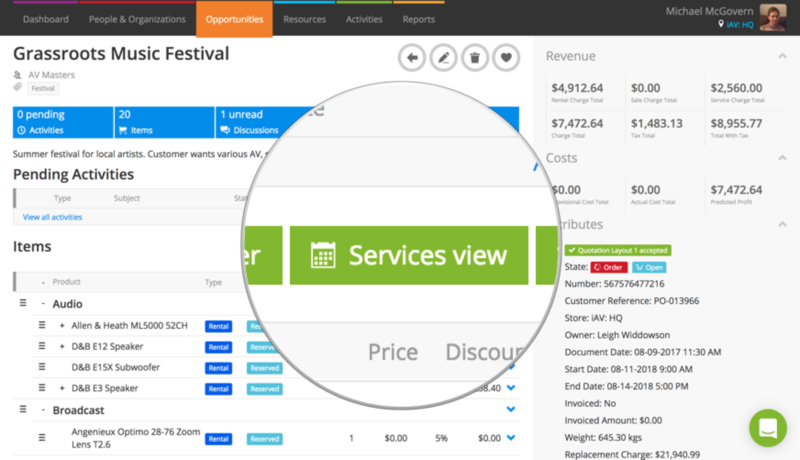 The services view is an agenda-style overview. You’ll see a breakdown of services required on each day of the opportunity, along with the status of the opportunity from the extended scheduler. Each service is represented as a block. In each block, you'll see the date & time of the service, quantity, and name. A service that spans multiple days will have a small protruding arrow either side of the service to let you know that it started on the previous day or is continued on the next day. Edit services directly from the service view if you need to. Click the blue arrow to the right of a service and choose Edit from the menu to change quantity, price, rate, and start & end dates/times. From here, you can also manage advanced allocation of bookable resources or sub-contract a service. To delete a service, choose Delete from the menu. What are the service statuses? The border around each of the services on your opportunity will change depending on it status. This is the initial status and means that you’ve not selected bookable resource for the service. When bookable resources have been selected for a service or you’ve set a sub-contract supplier, the block is marked as allocated. If more than one bookable resource is required for a service and you’ve not allocated them all just yet, the status is mixed to let you know that you’ve allocated some resources but some remain unallocated. Confirmed is a secondary stage after allocation. It means different things to different business. Booked out happens after allocation and confirmation. It means different things to different companies, but you might use it when you know people or vehicles made it to site. Once you've completed a service, the line is marked as completed. You can't modify details of a completed item. These are the same colors you’ll see used in the detail view when managing your product allocations.